Lull your little ones to sleep with this collection of traditional favourites, popular VeggieTunes selections, and some wacky new songs! You'll get over 30 minutes of Junior and his Veggie pals singing along with their kid counterparts. 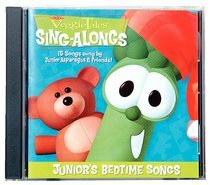 This CD features 15 bedtime or slowdown songs sung by Junior Asparagus, with a lot of help from his mum and his friends! About "Veggie Tunes: Junior's Bedtime Songs"
Phil Vischer came up with the idea of computer animated characters based on vegetables in the early 1990s. To develop the concept he founded Big Idea Productions, Inc. with Mike Nawrocki, and in 1993 the first Veggie Tales video was released. Since then Veggie Tales has been a phenomenal success, running to nearly 50 storylines and reaching a whole generation of children. The animations feature a colourful core cast of 'Veggies' led by Larry the Cucumber and his sidekick Bob the Tomato. They bumble their way hilariously through adventures that interweave Bible themes and popular culture references - like Sherlock Holmes, Indiana Jones, and Robin Hood. The aim is always to impart biblical life lessons. Key features of each storyline are a memorable 'silly song', performed by one or more of the characters, along with a concluding 'What have we learned' round-up of the main lesson. The Veggie Tales series was adapted successfully for TV in 2006, and Big Idea has also released Veggie Tales books, music CDs, toys, and clothing, as well as two feature-length movies Jonah and The Pirates Who Don't Do Anything. In 2012, Classic Media - the parent company of Big Idea and Veggie Tales - was acquired by DreamWorks, which has produced such hit animated films as Shrek and Madagascar.